Looking to enjoy a meal out in Wichita where you can bring your four-legged friend? 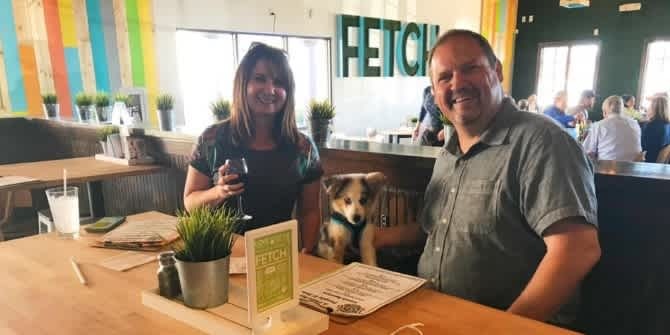 Wichita has a café designed especially for your dog plus a number of dog-friendly restaurants that allow you to bring your pup and enjoy outdoor seating. Here are 9 of the most dog-friendly restaurants in Wichita. 1. Fetch Bar & Grill is dog-themed, dog-friendly inside and outside, and it actually has menu items for canines! The family-owned café and menu were reinvented on a 2017 reality show featuring celebrity chef Gordon Ramsey. You can enjoy comfort food and order biscuits and bowls of food for your pooch. There’s an outdoor play area with obstacles, too. 2. Enjoy a craft beer and pizza while your best friend is hanging out with you on the outdoor patio at Wichita Brewing Co. & Pizzeria – West or Wichita Brewing Co. & Pizzeria – East. 3. Most of Wichita’s craft breweries with outdoor spaces allow dogs, though most don’t have full kitchens. Nortons Brewing Co. is one of the few and they offer a large menu of deliciousness, from the bacon crack appetizer to tasty sandwiches and burgers. Dine in their outdoor beer garden if you bring your furry friend, and even get a brew for him or her too! 4. Bring the leash and head to the patios at Dempsey’s Burger Pub - East or Dempsey’s Burger Pub – Clifton Square. 5. Check out the Historic Delano District with your dog and stop for a spell on the expansive patio at Monarch, home of the largest craft bourbon and whiskey collection in the state. They serve a delicious menu with many items featuring meats that are smoked in-house daily. 6. You feel like you’re in a friend’s backyard when you sit with your pup at the patio outside Ziggy&apos;s Pizza – Clifton Square. There’s also outdoor seating at Ziggy’s Pizza – West and Ziggy’s Pizza – Northeast. 7. Enjoy brunch on the patio with your hound at your feet at Wine Dive in the College Hill neighborhood. The restaurant and wine bar are annual recipients of the Wine Spectator Best of Award of Excellence. 8. If you’re grabbing a drive-through meal with a furry passenger, ask for a special pet treat at one of these seven area locations of Wichita-founded Freddy&apos;s Frozen Custard & Steakburgers: East, Northeast, Northwest, West, Southwest, Derby, El Dorado. 9. Enjoy the family-friendly sports vibe at Bubba&apos;s 33, where you can sit in the Garage area with your four-legged buddy. It’s a seating area with retractable doors that offers booths and plenty of TVs around a bar. Wichita offers more than 1,000 restaurants to suit any appetite. Make sure you check out our extensive list when you plan your trip to Wichita.